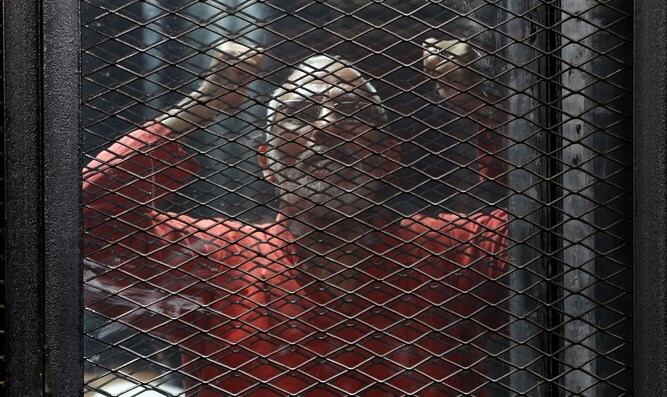 Egyptian court sentences Muslim Brotherhood's supreme guide, Mohammed Badie, to life in prison for planning attacks. An Egyptian court on Monday sentenced the Muslim Brotherhood's supreme guide, Mohammed Badie, to life in prison for "planning violent attacks", judicial officials and a lawyer said, according to AFP. Badie was part of a group of 37 people accused of conspiring to stir unrest during protests that followed the July 2013 military-led ouster of Egypt's former Islamist president Mohammed Morsi, who hailed from the Brotherhood. The court sentenced Badie to a life term along with Mahmoud Ghozlan, a Brotherhood spokesman, and Hossam Abubakr, a member of its guidance bureau, the officials and defense lawyer Abdel Moneim Abdel Maksoud said. They were sentenced in a retrial that was ordered after Egypt's court of cassation scrapped a 2015 ruling under which Badie and 13 others were condemned to death, and 34 defendants given life terms. The court acquitted 21 others, including Gehad Haddad, an international spokesman for the Brotherhood. Badie has in the past called for a jihad (holy war) to liberate Jerusalem from Israeli rule. A video released by the Middle East Media Research Institute (MEMRI) showed him telling the court that his movement was not against Egypt but only against the Jews. The Brotherhood has faced the toughest crackdown in its history since Morsi’s removal, with thousands of Brotherhood supporters having been jailed.